Every World Cup tournament has its own mascot and some of the choices down the years have been truly memorable. In 1966 we had World Cup Willie followed by 1982’s Naranjito, an orange decked out in full Spanish kit. There has been a mascot at every world cup since the 1966 tournament in England but what have the organisers come up with for Brazil in 2014? 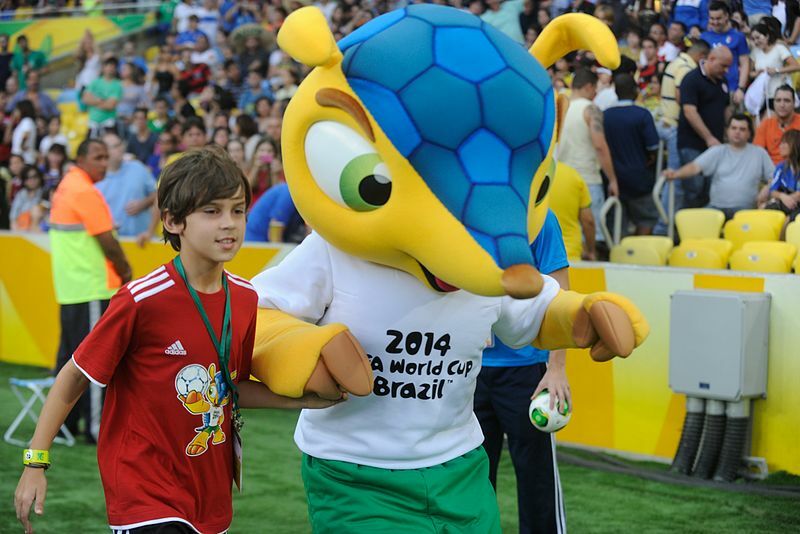 The official mascot for the 2014 World Cup is known as Fuleco and he is a rare, three banded armadillo which can only be found in the country. The species is on the vulnerable list worldwide and it was felt that such an unusual native would be a perfect choice for this summer’s tournament. The name is derived from two Portuguese words – Futebol and Ecologica, meaning football and ecology respectively. He is seen wearing a white T shirt and the green shorts of his native country. 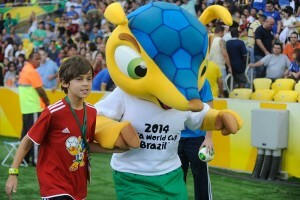 Fuleco received his official launch on 25 November 2012 on a national TV programme and early indications suggest that the creature is poised to become the most popular world cup mascot of all time. Within two days of that launch, 89% of Brazil’s population said that they had already seen the armadillo. Fuleco’s personality is described as cheerful, confident and proud. He does not talk but has a very appealing personality and he loves to dance and entertain children. This year’s mascot also has his own Twitter page at @fuleco so be sure to follow his antics throughout the tournament as he becomes a very integral part of this year’s finals. Official World Cup anthems actually pre-date the mascots and the first song to appear was ‘El Rock del Mundial’ which was introduced ahead of the 1962 competition in Chile. Other great titles to be published over the years include ‘Hot Hot Hot’ for Mexico 1986 while 2010 in South Africa employed global stars in Shakira and Freshlyground who gave us ‘Waka Waka’. In the modern day, world cup anthems are usually sung and played by big stars and 2014 is no exception. 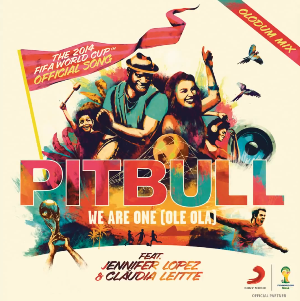 ‘We are One (Ole Ola)’ is by Pitbull and it also features Jennifer Lopez and Claudia Leitte and it was announced to the world back in January of this year. Unfortunately, the anthem hasn’t received the backing that mascot Fuleco has enjoyed and in fact, there has been widespread criticism of we are one, both in Brazil and beyond. Those critics feel that it is full of generic clichés and that it has missed the chance to embrace Brazil’s rich musical heritage. Here’s a typical comment from Brazilian journalist Gaia Passarelli. Whatever your opinion may be, there’s no stopping the song which now has an official video to accompany it. It was first performed live by the main trio of Pitbull, Lopez and Leitte on 18th May 2014 and naturally it will form a pivotal part of the opening ceremony for this year’s tournament. There are opposing views of two of the main features of the 2014 World Cup. Fuleco the official mascot has been warmly received but sadly, the same cannot be said about the anthem. You’ll have plenty of time to see and hear both over the next few weeks and that gives you the perfect opportunity to make up your own mind.